The challenge was a fun and welcomed one for the teenagers who gathered from across the archdiocese. Asked to “make noise,” they responded with a crescendo of cheers, hoots and shouts that rose to a joyous, near‑deafening roar in the expansive room, leaving the youths laughing and smiling at how many decibels they had reached together. Still, just minutes later, there came a moment that packed even more emotional power. 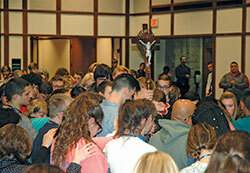 It was a moment when the 270 teenagers changed from making noise to making a statement about the Catholic faith that binds them. Rising from their seats, they moved toward the crucifix that had been uplifted in the center of the room. With their heads bowed and with some of their hands on each other’s shoulders, they stood and professed their faith not in words but in reverent silence. 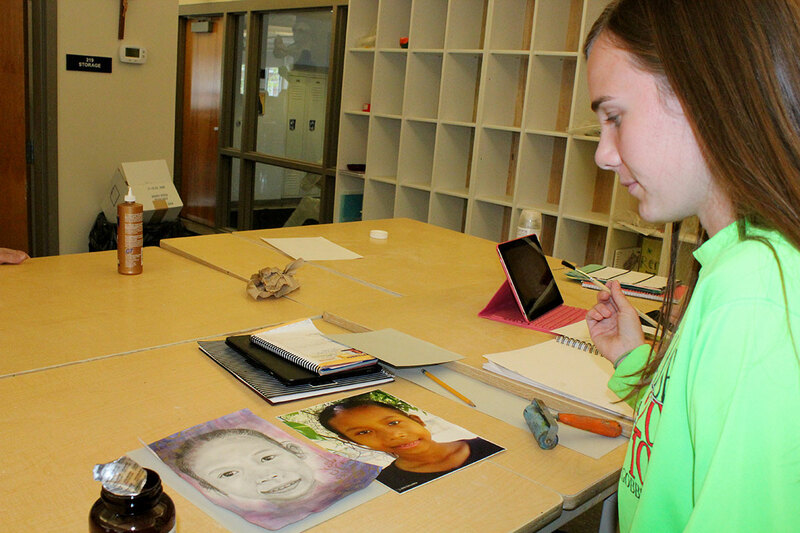 Both 17, Elizabeth Wehrkamp and Alejandra Aguilar shared in these two scenes during the “ArchIndy Teen Experience” at Butler University in Indianapolis on Nov. 4. Living the Catholic faith aloud is essential to Alejandra too, who viewed the archdiocesan youth event as a two-fold opportunity. The ‘Make Noise’ theme for the youth event echoed from a different kind of challenge—a challenge that Pope Francis put forth during World Youth Day in Brazil in 2013 when more than 3 million young Catholics came together. As the keynote speaker at the archdiocesan youth event, Ansel Augustine reminded the teenagers of three truths about their lives, starting with the one that he considers most fundamental. “Never forget, you are a sacred gift from God. There will never be another like you,” declared Augustine, director of the Office of Black Catholic Ministry for the Archdiocese of New Orleans. That power to make noise for God is needed in the world today, he continued. “Many times in the Church, we are called to step out. We are called to stand out. We are not called to do the easy thing or the popular thing. We as people of Christ are called to do the right thing. So when you look at your own scenario, your own story, your own situation, who is it that you are called to be Christ to? And how are you called to make that person know it so that they can make a joyful noise in their life? Augustine let the youths know that they are the answer to that question. He also shared one more truth concerning the challenges in their own life. That need for God in the teenagers’ lives was revealed during the part of the conference when the sacrament of reconciliation was offered. Elizabeth Wehrkamp joined that long line. A similar focus on deepening the faith came during the praying of the rosary, with the prayers and the reflections on social justice being shared in both English and Spanish. 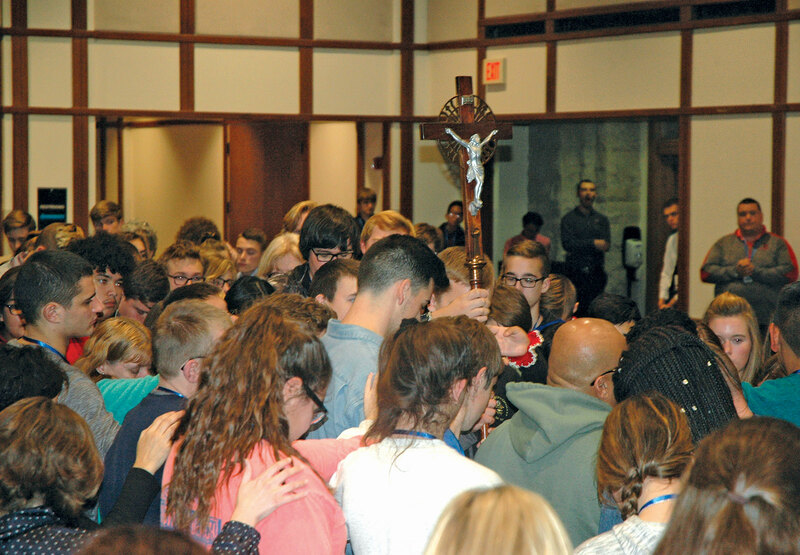 “Once we experience the love of God through prayer, it encourages us to put it out there through action, through excitement,” said Juan Aguilar, the 25-year-old archdiocesan seminarian at Bishop Simon Bruté College Seminary in Indianapolis who co-led the praying of the rosary. While a touch of joyous chaos reigned in the games, so did the smiles and laughs. And as the late afternoon turned toward early evening, the mood moved flowingly from making noise to making a statement to making time to be with God in a closing Mass celebrated by Archbishop Charles C. Thompson—a Mass where the soulful singing of a choir from St. Barnabas Parish in Indianapolis added a beautiful harmony. As he shared his homily during the Mass, Archbishop Thompson smiled as he looked out on the youths who had come from parishes in Bedford, Bradford, Brownsburg, Cambridge City, Greenwood, Indianapolis, Martinsville, Mooresville, New Albany, New Castle, Rushville and Terre Haute. Concluding his homily, he offered a touch of praise and encouragement to the youths. The heart of that message took on a real-life touch at the end of the Mass when the director of youth ministry for the archdiocese shared an experience that happened earlier during the celebration. Williams assured the young man he would, and he asked the youths to do the same.